I have been asked to write a few words on moths and NMW. So here, in a not too roundabout way, I’ll attempt to explain the significance of moths and National Moth Week . Why should anyone study moths at all…. ? An intrinsic answer would be “because they’re there, they exist.” (just like people climb mountains, because they’re there!). That doesn’t get many kudos points for function, though. Certainly wouldn’t get one funding for a research proposal. Let’s take a different perspective. Bees – o.k. they’re not moths, but they do an important job – you know, pollination. No bees, then no almonds, no honey, no apples (you get the idea, no bees then a lot less things that humans eat.). Well let’s think along similar lines, but for moths. Now bees generally do a day shift, whereas moths (the vast majority, at any rate) are nocturnal. So without moths we have – no papaya, longan and a whole lot of other fruit and vegetables – specifically with white and pale blue flowered species. Why white and pale blue – because they reflect moonlight, i.e. reflected sunlight, best. Moths (and many other nocturnal creatures) have eyesight geared up to detecting faint moonlight, in particular the ultraviolet wavelengths (undetectable to humans). Very few people (perhaps none) have actually looked at the whole picture of just how much moths and other nocturnal pollinators contibute to human wellbeing (i.e. “our” food), but it will not be inconsiderable. Put aside the rich diversity of species numbers, abundance of some of these species, the amazing variety of colours, shapes and patterns moths utilise (mostly as some way to stay alive – a difficult task at the bottom of the consumer food web). 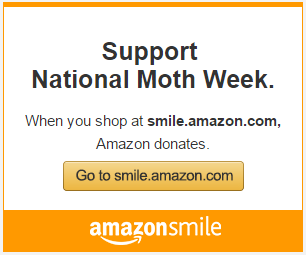 Let’s hear it for moths – providers of a major eco-service: pollination. What about other ecosystem functions? Moths are pretty much at the bottom of the food web. They undertake quite a few roles, but major in herbivory (eating plants) and detritivory (eating dead plant and animal matter – there are many moth species that play a significant role in recycling nutrients). Without moths (especially their larvae) so many species would be hungry – birds, small (and sometimes large) mammals, predatory insects, spiders, frogs, toads, snakes, fish (yes, there are aquatic moth larvae, too!) . . So moths are food for other species and use dead other species as food. Sounds a bit cyclical, but it works! Can’t get away from the food theme yet, then! So if the moths don’t want to be on someone else’s menu? – O.k. how much space do I have?? This is a long story, but I’ll try to be short and punchy. Think mimicry – moths do this pretty well. They can (depending upon which moth species one chooses, because one species will mimic one other item) visually mimic a whole range of items you’ll see in the natural environment – bird poo, lichen, tree bark, fresh leaves, dead leaves, partly eaten leaves, snakes, other moths, bees, wasps, spiders (and more); i.e. they try to blend in (crypsis) or mimic poisonous things that most predators avoid. How cool is that? Avoidance is not just visual, either. Some species have taken the evolutionary warfare thing a little bit more to the extreme – tiger moths can hear their nemesis (bats) coming (the echolocation calls of bats), and then can answer back with their own ultrasound. Scientists have two theories as to what the replies mean; it could be a mecahnism to “jam” the bats echolocation, causing confusion to the bat and make it miss its target; alternatively, it could be a message to the bats to say “keep off, I don’t taste good” (which is possible as most tiger moth species contain a distasteful chemical to deter predators). There’s a third important moth sense – smell. Adult moths mostly use smell to track down (maybe I should use the phrase “sniff out”) a partner to continue the species… Some moth species are incredibly effective at this, being able to detect pheromones (moth perfume!) from several kilometres away (downwind only!). The antennae on the top-front of the head have evolved specifically for this task. There’s one moth genus – Acherontia – that use all three senses in mimicry. They mimic bees to gain access to the beehive for honey; using cunning deception. Acherontia moths smell like a queen honey bee; they can emit a squeek that sounds like a queen honey bee buzzing her wings; they have a marking on the top of the thorax that looks like a bee (we recognise it as a “mask”, but turn it through 180 degrees and one should see a bee, maybe – that takes a little imagination if you ask me). Enough. I hope you are starting to get a glimmer of understanding as to why moths are important. Well how about finding out a little more about them? Where they occur; when they occur; in what abundance do they occur; under what conditions do they occur; which species can be found??? 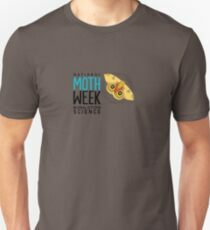 This is where National Moth Week comes into play. By getting lots of people out into the wider environment, rather than stuck indoors, and recording both daytime and night time moth (remember this means any part of the life cycle – egg, larva, pupa or adult) activity, and then reporting all these data and observations, it becomes possible to see answers to big picture, continental, even intercontinental scale, questions. Especially for events repeated over time. In some ways NMW is actually only partly helpful here, because NMW gets lots of people to participate once in a while; whereas what is really needed is lots of people to participate on a more frequent regular basis. That’s where data depositories like iNaturalist come in – because it’s possible to use these data “banks” at any time of year, both to make a deposit (an observation) and a withdrawal, either by the same person who made the deposit, or by an agreed account holder who uses or organises a particular project through iNaturalist. 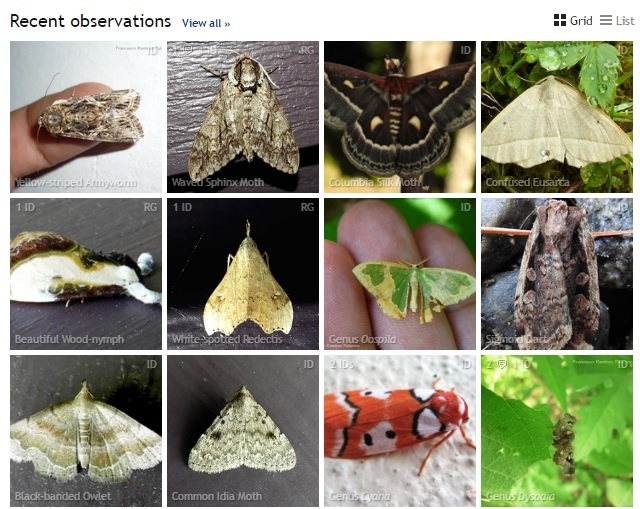 Let me give you an example: I run the Hong Kong Moth Recording Project (HKMRP) on iNaturalist. It has been running since 2011, and over 150 people have placed some 7,200 observations of over 1,000 moth species in Hong Kong with iNat and the HKMRP. The geographic coverage of these data is much more complete than if I had tried to record the same number and distribution of data observations in the same time. Just not logistically possible. What does NMW share with HKMRP ? Well, apart from being hosted on iNaturalist, both projects use the same citizen science approach to obtain data, getting lots of observers to voluntarily submit observations of moths. However, NMW is in many ways a feeder system, getting across to many more people than any one long term local project ever could, but (hopefully) enthusing the same people to become more involved in other local (or regional, or even national) moth recording projects that aim to improve our knowledge and understanding of the moth species and their habitats upon which we, as well as many other species in the environment, depend for our own survival. Remember, we have only one planet that we call home. In spite of all the research done on astronomy, physics, space travel and all the other sciences that take tax payers money in many countries, we still don’t know many of the basics of the biological system called “life on Earth”, without which humans will not survive. At the moment we are making a global scale pig’s ear of looking after Planet Earth. So get out of the house, into the garden, the yard, the lot, the allotment, the park, the nature reserve, the country park and do a bit of mothing for NMW and for you. If you enjoy it, don’t let the end of the NMW week stop you – get curious, find out more and report back to NMW (and your “local” moth recording group or project), please. Your world, my world, my daughters’ world, our next and further generations’ world will be the better for it. Administrator, iNaturalist’s Hong Kong Moth Recording Project. This entry was posted in Data Collection, News & Updates, NMW Collaborators, partner and tagged data, iNaturalist. Bookmark the permalink.